You pick up the newspaper and it tells you that the governor has just inaugurated a new school in a far-off rural town. You turn on the television and you see a “reality” show where six men compete for the attention of one woman amidst unfathomable luxury on the beaches of Ibiza. And then you walk out into the street and watch the walls as you walk and the walls tell you that the police assassinate, that 22 murders of activists in your town remain in impunity, and that people keep organizing, people rise up, people fight hack. In Oaxaca, Mexico the walls are media and the message is revolt. In 2006, a teacher’s strike turned into a massive popular uprising after a failed police raid led to a spontaneous and unarmed counterattack which drove the police out of town. From June 14 until November 25, the people of Oaxaca occupied the city center and combated state-organized death squads by taking over local radio and television stations and building hundreds of barricades across the city. The newly created Oaxaca Peoples’ Popular Assembly, or APPO, called on people from all over Oaxaca to organize and join the movement. 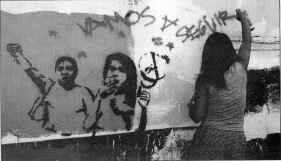 During this time a number of young artists began covering the city walls with stencils, graffiti, and wheat-pasted images denouncing the police repression and chronicling the people’s revolt. The walls became newspapers, capturing in popular art forms the developments of the movement. Many of these artists formed the Oaxaca Assembly of Revolutionary Artists, or ASARO. Two years after the repression of November 25, 2006–when militarized federal police beat and arrested hundreds of people in the course of raiding the protest camp in front of the Santo Domingo Cathedral–ASARO continues to organize and make art for the streets of Oaxaca. Their images denounce state violence and impunity, and chronicle the spirit of resistance and rebellion that endures. Besides the power of their images and their transformation of the streets into a people’s gallery and newspaper, the impact of ASARO can be measured by the speed with which the Oaxaca state government paints over the revolutionary images–typically a matter of hours in central Oaxaca City–and the violent police response to street painters. Dieska, 24, also joined ASARO in 2006. He was studying art and already drawn to social and political art when the uprising began. “I couldn’t paint little flowers when the police were cracking people’s skulls; our art needed to reflect what was happening socially.” The walls became a battlefield of the image, Dieska says, for a war that is ongoing. While the capitalist media proclaims that Oaxaca is now in peace and “law and order” have been restored, the task of graffiti and stencil artists is to “show the terror” imposed by the state. But not only the terror. ASARO member Itandehui, 21, says that one of the main challenges of ASARO is “not only to spread the message of beatings, but also the fact that people are resisting.” On November 25, 2008, while over 100,000 people marched through the streets of Oaxaca, ASARO and other individuals and collectives painted the walls with images commemorating the uprising of 2006 and the spirit of revolt that remains despite the climate of state terror. One stencil shows an image of Ulises Ruiz–the tyrant at the head of the state violence in Oaxaca at present–holding up a pistol with the caption, “Fourth state of the state address.” Several stencils show iconic moments of people facing off with the police in the streets. Another stencil shows a lit Molotov cocktail and says: “2010, we are ready,” referencing the widely discussed belief that Mexico will live another major social uprising in 2010 as it did in 1810 (the War of Independence) and 1910 (the Mexican Revolution). In Oaxaca, as in so many other places, the very system that administers oppression administers the airwaves. Collectives like ASARO subvert media control by covering the streets, walls and sidewalks, with images that speak the truth of state violence and give voice to the ongoing spirit of revolt.